Despite new curative antiviral treatments for Hepatitis C Virus infections, the number of deaths from Hepatitis C in the U.S. is on the rise, and the increase is hitting particularly hard among middle-aged people, a new study from the Centers for Disease Control and Prevention (CDC) reports. The study found that the number of deaths in the U.S. from Hepatitis C rose from 11,051 in 2003 to 19,368 in 2013. And baby boomers – ages 55 to 64 – accounted for 51 percent of the deaths in 2013, according to the study. The hepatitis C virus infects the liver cells and can lead to serious liver problems, including cirrhosis (scarring of the liver) or liver cancer. In the analysis, CDC researchers looked at data collected from death certificates in the U.S. between 2003 and 2013. The researchers compared the number of Americans who died each year from hepatitis C to the number of deaths from 60 other 'nationally notifiable' infectious conditions, such as HIV, pneumococcal disease, tuberculosis, measles, mumps, rabies and Lyme disease. 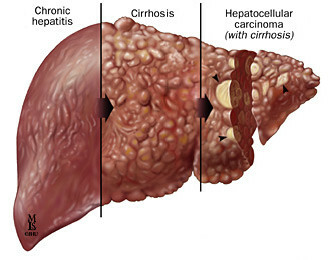 During the study period, there was an average yearly increase in deaths from hepatitis C of more than 6 percent. 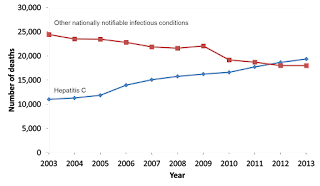 During the same period, deaths from the 60 other infectious conditions included in the study decreased: they fell from 24,745 in 2003 to 17,915 in 2013, or an average yearly decrease of more than 3 percent, according to the findings. 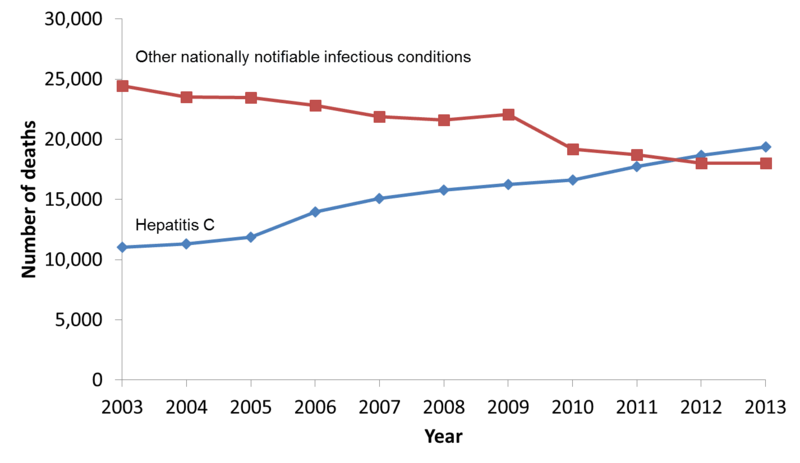 In 2012, the number of Americans who died from Hepatitis C exceeded the total number of deaths from all 60 of those other notifiable infectious conditions, the researchers found. Hepatitis C spreads primarily when people share needles, syringes or other equipment used to inject drugs. But before 1992, when the U.S. began screening the blood supply for the virus, hepatitis C was also commonly spread through blood transfusions and organ transplants. Many people who are currently infected with Hepatitis C are baby boomers who may have experimented once or twice with an injectable drug when they were younger. Because people are not routinely screened for Hepatitis C, about 85 percent of those infected with the virus don't even know they have it. And if you don't know you are infected, you will not get effective treatment.